Ensuring work force personnel receive adequate training to undertake their duties in a High Voltage environment is an essential aspect of any employer’s responsibilities. 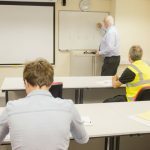 Inadequate training regimes are often the reason identified by the Health and Safety Executive for accidents and incidents occurring in the work place. It is of paramount importance that industrial personnel receive correct training from accredited training providers, who in turn, will provide documented evidence of their achievements. Understanding and identifying any safety compromising situations which may exist within their working environment. An appreciation and understanding of the importance of Personal Protective Equipment. Equipment functionality, including protection parameters. Isolation protocols, associated authorisation levels.